Is it snowing in Saariselka ?¡Gracias! Saariselka in Finland is a minor ski resort with only 180 metres (590 feet) of vertical descent. We have no information about the existence of any cross country ski trails at Saariselka. 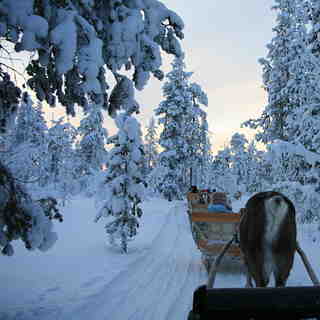 Saariselka is the smallest of the resorts I have visited in Lapland. The village is quite compact. As a cross country skier I enjoyed the variety of tracks, going through woods, across lakes and over fells, although the wind and cold made some of the slopes icy and tricky. There is a great, steep, looping descent from the top of the fell down to the village. 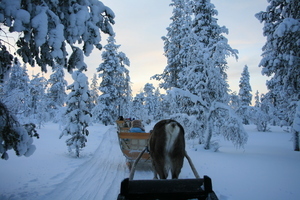 The tracks also take you out to a gold mine, and the tracks from the hotel with the igloos (I can't remember the name) back to the village give a lovely undulating route with reindeer around to keep you company. Being further north than the other resorts used by Brits, the sunlight in early January is almost non existent, giving a twilight to ski in, which some may find depressing. but when the sun rises I imagine you get the same beautiful skies that contribute to the magic of the Arctic. We saw our best displays of the Northern Lights in Saariseka.